Be the first to share your favorite memory, photo or story of James 'Jamie'. This memorial page is dedicated for family, friends and future generations to celebrate the life of their loved one. 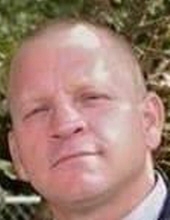 James “Jamie” Byron Harless, 46, of Barnesville, passed away November 27, 2018. Jamie was born on July 19, 1972 in Augusta, GA to the late William Harless and Sue Lloyd. He was a hard worker, loved his family and a member of AA and NA in Griffin. Jamie was preceded in death by his brother, Steven Harless. A memorial service will be held at 3:00PM on December 8, 2018 at Fellowship Baptist Church, 3133 Crest Highway, Thomaston, GA 30286. Survivors include his children, Kayla (Leighann) Harless, Jordan Harless and Dylan “D.J.” Harless; mother of his two youngest children, April (Scott) Everitt; special aunt, Beverley Abidin: numerous aunts and uncles; extended family and friends. To send flowers or a remembrance gift to the family of James 'Jamie' Byron Harless, please visit our Tribute Store. "Email Address" would like to share the life celebration of James 'Jamie' Byron Harless. Click on the "link" to go to share a favorite memory or leave a condolence message for the family.